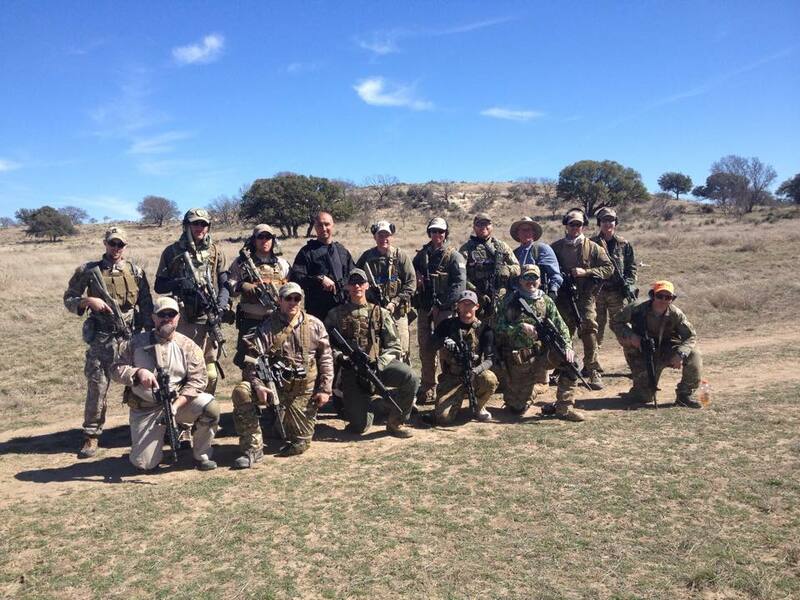 This 5-day class was held at a ranch near Brady, Texas. Most of the students stayed at a hunting lodge located at the ranch, so that really helped develop the team mentality. Note: Lecture periods, with whiteboard, colored magnets, and dry erase pens preceded the field exercises. This helped immensely, since we understood what we were doing and why we were doing it when we got out into the field to physically do the drills. Day1 was what most of us are familiar with – safety briefing, square range zeroing, turns, controlled pairs, malfunction clearance drills, etc. Day2 was intro to 2-man “buddy pairs” bounding forward and backward on the square range, then some very simple 4-man team stuff (2 buddy pairs) bounding forward/backward, peeling left/right out in a big field. Day3 started with individuals going through a “jungle walk” to hone RTR – Return fire, Take cover, Return appropriate fire. We then moved into progressively more complex 4-man team stuff. Same basic techniques, but performed on more broken ground, more brush, etc. There was some discussion on patrol movement techniques, but this was not a “patrol” class. We used a column formation to begin the dismounted contact drills, since it was appropriate to the terrain. Column is kind of a cockeyed diamond with one buddy pair in the front (“alpha” team) and one pair in the rear (“bravo” team). Once we started functioning as 4-man teams, probably 75% or more of what we did was break contact drills – fighting backward by buddy pairs, or peeling off the “X”, or combination of both. A few drills were fighting forward through the contact. Days 4 and 5 were the “Mobility” portion of the course – vehicle based drills. There was also a “hasty squad attack” drill on Day 5, which was the highlight of the course for me. Scenario was two 4-man teams on patrol take fire, front team reacts and suppresses the enemy while the other does a flanking maneuver and fights through the enemy position. The instructor was clear that, for safety reasons, some of the scenarios were not as realistic as they could be. He needed to be able to see all of us in order to control us, we needed decent backstops for all those rounds downrange (2,000+/- rds per student), exaggerated offsets to keep from shooting vehicles (rather than shooting under the vehicles from behind the axle or engine block), driving slow, etc… Also, some of us 40+ year olds had aches and pains, gimpy knees, or whatever, so at times we would kneel when going prone would have been more realistic if bullets were flying both ways. I was AMAZED at how far our skills advanced in 5 days, and all in a very controlled, methodical, way. It was a pretty sharp group of students, an EXCELLENT instructor with a well-planned training progression, radios for comms, safety guys assisting on some of the drills, attention to safety angles, backstops, etc… I’ve taken other classes where I sat out drills that I thought were pushing the edge of safety too far. Not this one. I never felt like I had anything to worry about.